Kim Jong Il, the evil man who all the parents on South Korea uses for frightening their children if they don’t tidy up and clean their rooms before going to sleep, is preparing a new mass destruction weapon. 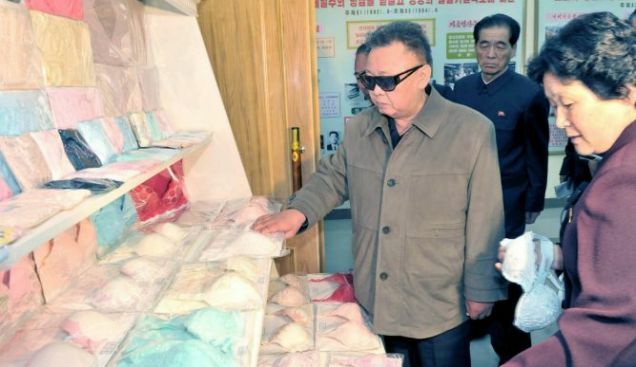 According to my ill-informed sources North Korean leader Kim Jong-Il was inspecting many bras at the Rakrang Ponghwa Garment Factory in Pyongyang. “From I watched in the Japanese Anime series Mazinger Z (Tranzor Z, USA version) where it appeared the robot's female: Aphrodite A which had embedded missiles on her chest, posing as breasts, that I had always felt the need of doing something similar. Now it is a big day, because I got my childhood dream.” – declared the dictator to a local station. Barack Obama is noting down about this new threat for the world and might be in a future not too distant to take action against him.